I have discussed it before HERE. I well just "can't stend heem" (okay people does anyone but me know that is from Singing in the Rain...anyone...please someone tell me you know that part). Okay, so the truth is out. Old movies that are musicals...check. Coleslaw...uncheck...wait is that possible to uncheck an item. Officially making it possible. With all my coleslaw hate out of the way, I now must issue a disclaimer. This Chinese coleslaw...oh for heaven's sake...make my serving a double. Seriously people. I loved it. Loved it so much I just ate it straight out of the bowl. Not the individual serving size bowl. The big bowl. You know the big bowl you mix everything together in before you serve it up. Just imagine it with me. 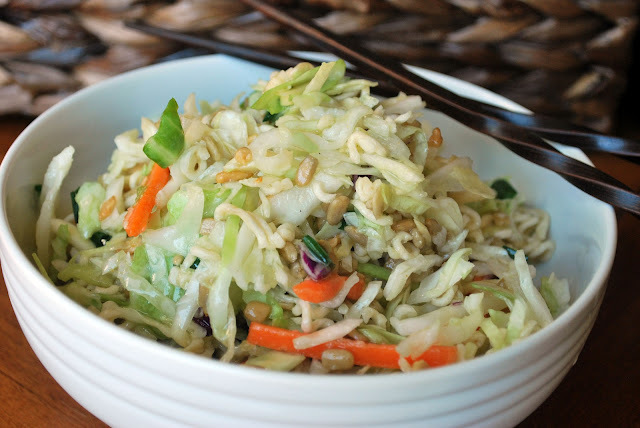 Hubby and I bent over said giant bowl greedily shoveling forkfuls of Chinese coleslaw into our mouths. Old movies that are musicals, like for instance Flower Drum Song...check. 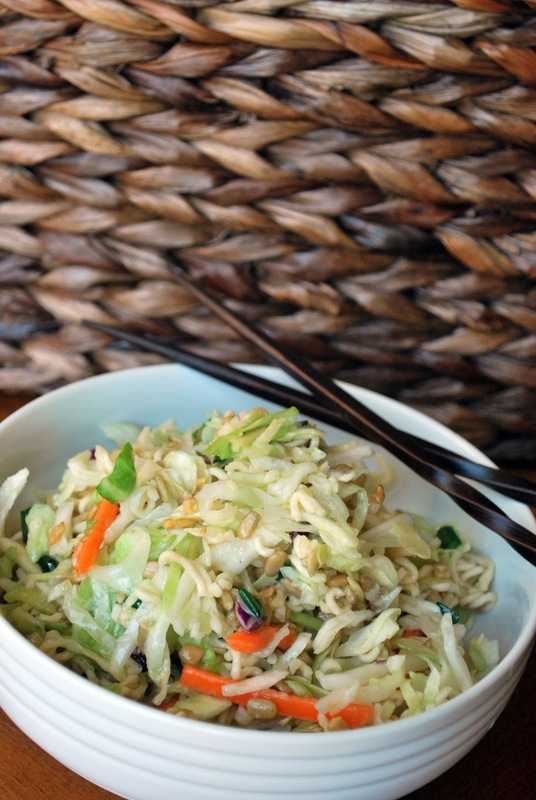 The prepared coleslaw mix used in this recipe totally gets an upgrade thanks to the sunflower seeds, almonds, green onions, ramen noodles, and a pretty awesome dressing. Match this up with some grilled chicken. Instant Summer meal. Instant yumminess. In a large bowl, mix coleslaw, sunflower kernels, almonds, green onions, and noodles. Pour the dressing over the coleslaw and toss until the salad is evenly coated. I feel the same way about regular cole slaw (yuck) and Chinese coleslaw (yummy). Now I know how to make the stuff I like, thanks for sharing! Ummm this is really weird. 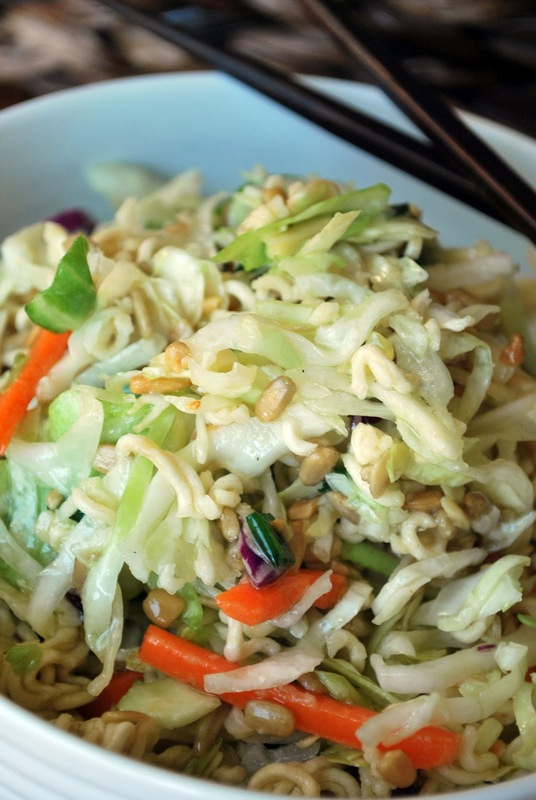 My post for tomorrow is for an Asian cabbage salad and I wrote a whole thing about "Has this, check. Has that, check." I suppose great minds think alike, right? I think I am going to post it right now! Just so you can see. It makes a ton--which is good--and my dh and I fight over the leftovers.